No pad rent! Pre-paid lease making the monthly fees only $94 per month. This home located in Country View Mobile Home Park has two bedrooms and a den, one four piece main bathroom and a large ensuite with a jacuzzi tub. There is also central air, gas fireplace, vaulted ceilings and a large, private yard that backs on to park land. Enjoy the mountain views from many windows. 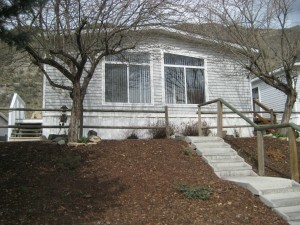 This home is located in a very quiet area, close to the river and has peek-a-boo water views. There is RV parking and 3 parking spots with this unit. Lease is pre-paid until 2025.